Doherty QB Luke Brennan won the game's MVP after a pair of touchdown runs. Doherty rolled out to an 18-0 lead, but Burncoat made things interesting, and forced the Highlanders to reinsert their starters in a unique Thanksgiving Day match up. What made things unique for both squads was the fact that this game, ultimately, meant nothing to Doherty. The Highlanders won Division 4 Central, then defeated Western Mass champion Wahconah last week to earn a spot in the Division 4 Super Bowl on December 7th. 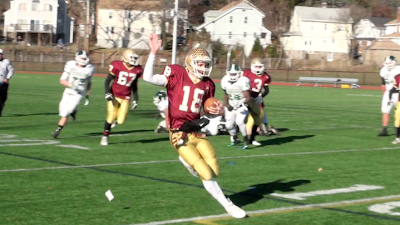 Doherty will face Eastern Mass champion Dennis-Yarmouth at 11 am at Gillette Stadium that day. Still, the Highlanders played their starters throughout the first half on Turkey Day, but a late scare by the Patriots forced quarterback Luke Brennan and co. back into the game for some late heroics. Check out the highlights, done by Suite Sports correspondent Warren Rodriguez, below. It's his broadcast debut, and we think he did quite nicely.